A lot of people find mathematics an overwhelming and challenging subject. It is the teacher’s responsibility to provide the students with appropriate resources so they can learn mathematics by heart. However, it can be also difficult for teachers to teach the subject if they are not organized and systematized. 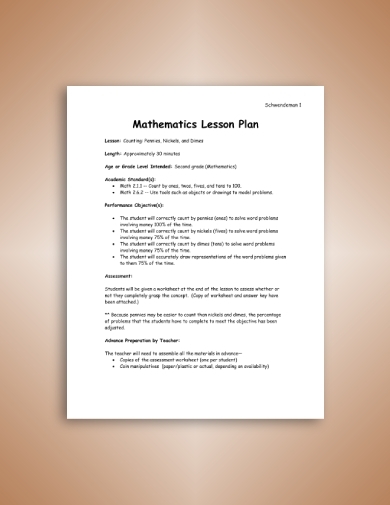 In order to have a smooth flow of the discussion and a step-by-step guide of the lessons, a math lesson plan is needed. 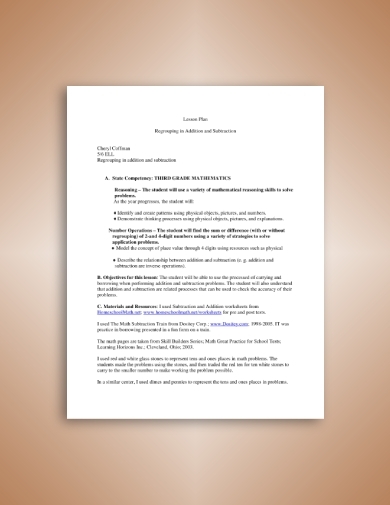 Presented below are useful math lesson plan templates and examples that you may refer to. In order for the teachers to effectively discuss a subject, they need to keep the lessons organized and in a detailed sequence. This can be done using a lesson plan. However, creating a lesson is almost always challenging for the teachers, and it will take a lot of time and effort in creating one. 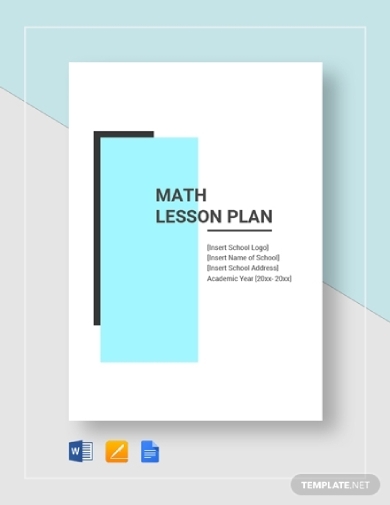 In order to help you create a math lesson plan with ease, you can use this template, which can be opened using computer applications that can open Google Docs, MS Word, and Pages file format. Having fundamental knowledge about graphs can help one understand and analyze the information contained in a graph as it can present information quickly and effectively. This is important as graphs are often used not only in education but also in businesses and government. So that the teacher holding such topic can effectively teach the students, this mathematical graphs lesson plan is needed. Also discussed in this lesson plan are several types of graphs, such as bar graph, line graph, circle graph, and pictograph. 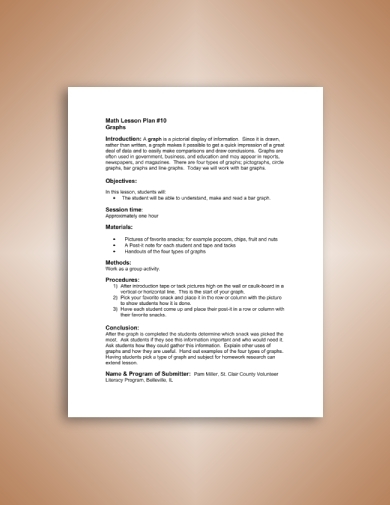 This is an example of a blank math lesson plan where you can fill out the pertinent information in the blank space provided, such as the lesson title, unit title, lesson number, class level, duration of the lessons, number of classes, teacher, lesson objectives, standards, essential questions, and evidence of learning. The learning plan is carefully presented step by step and in a detailed sequence. 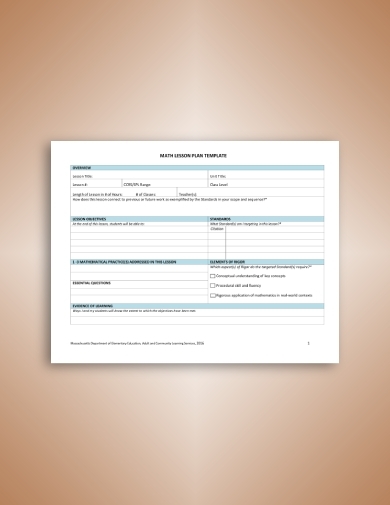 You can even fill out the materials needed for each learning plan in order for you to prepare the materials ahead of time. You may also input the estimated duration for each plan. As a teacher, professor, instructor, educator, or school administrator, it is important that you develop test readiness strategies in order to have the foundation regarding the six common core instructional shifts in the field of mathematics. 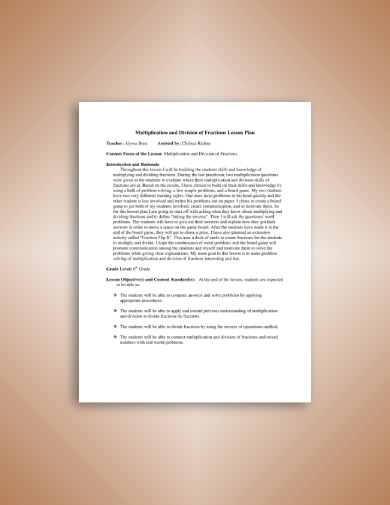 This study plan would also help the instructors know the rationale and research behind those instructional shifts, know how to implement the instructional shifts to the students, and know how the instructional shifts impact the teaching of science. The basic math lesson starts with counting numbers. Children in grade school are first taught on how to count with the use of interesting objects, shapes, or symbols. Basically, their activities involve counting the animals, fruits, balls, among others. The lessons regarding counting must be presented as simple as possible so that the students will have a strong foundation for future mathematics topics such as mathematical operations and comprehensive questions. 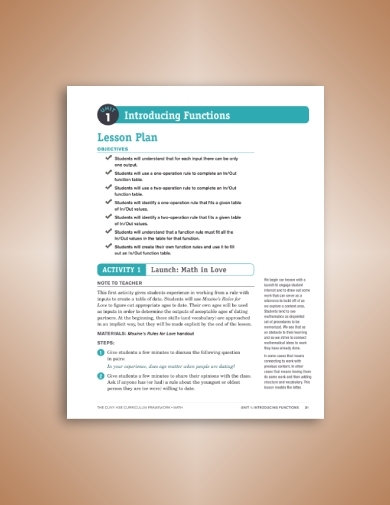 These activities, lessons, as well as their homework, must be systematically planned and organized following a counting mathematics lesson plan, such as the one displayed above. This functions math lesson plan is important in helping students understand that for each input, there can only be one output. Activities are also included, such as students using a one-operation rule to complete an in or out function table, using the two-operation rule that fits a given table of in or out values, and a lot more. 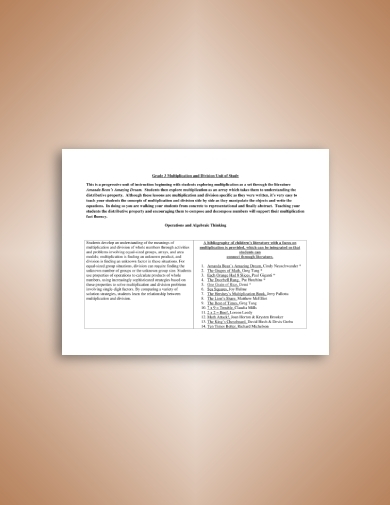 By the end of the discussion, the objective of this lesson plan is to create their own function rules and use it to fill out an in or out function table. The world of children is full of shapes and figures, and supportive parents want to enhance their children’s skill of identifying shapes and seeing the connection between objects. Aside from accurately identifying shapes to appreciate artistic works, recognizing and distinguishing various shapes is a fundamental mathematical skill. Hence, even at a young age, children must already have the ability to distinguish different shapes. 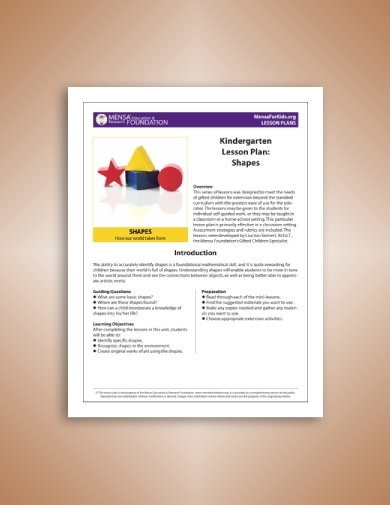 With this, a kindergarten math lesson plan for shapes must be used in order to have a guide on what lessons to discuss and how to discuss such topic. Most of the time, multiplying and dividing fractions bring confusion to students, especially those who are still in their grade school. Even some of the high school students have not yet fully understood the concept of fraction multiplication and division. With this, the math teacher handling the lesson must carefully present the lesson in the most basic and understandable form in order for the students to immediately grasp the topic. This can be done with the use of multiplication and division of fractions lesson plan, just like the one presented above. For grade three students, understanding the concept of multiplication and division can sometimes be difficult. The teacher’s primary duty is to provide them the materials to easily understand the topic. In order to do this, the teacher must brainstorm and carefully arrange his or her lesson first with the use of a multiplication and division lesson, similar to the example displayed above. During the first and second years in elementary, the basic math lessons that the students must know are addition and subtraction. These are the critical years since these lessons, along with multiplication and division, will serve as the groundwork for a lot of mathematical problems. To build a strong foundation for students, this addition and subtraction lesson plan can be of great help. So, the next thing that you are going to create a math lesson plan. 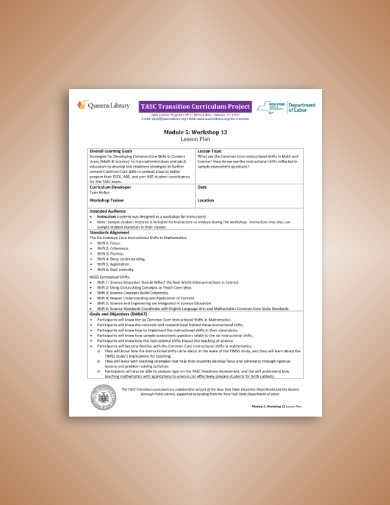 Do not forget to refer to the above templates and examples, for these can surely help you create an organized and effective lesson plan in different Math topics.